Brummen, The Netherlands 17 January 2019: Ink logistics provider GSE has been confirmed as one of six national regional winners of the Metaalunie Smart Manufacturing Award 2019 in the Netherlands. The company, based in Brummen, was declared the winner for Gelre. GSE and the five other regional winners will compete for the national award, which will be revealed on 13th March at the “Evening of the Manufacturing Industry” ceremony, staged at the Utrecht Jaarbeurs exhibition centre. In addition to jury chairman Anita van Gils, the jury consists of Aukje Kuypers, Businesswoman of 2018 and managing director of Kuijpers; Martin van Zaalen, editor-in-chief, Link Magazine; Paul d’Hond, senior advisor product management at the Chamber of Commerce; and Arjan Ester, CEO of Aebi Schmidt Nederland bv, the Smart Manufacturing Award national winner in 2018. 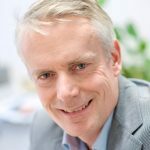 Maarten Hummelen is Marketing Director at GSE Dispensing.